It's time to start shopping for Christmas gifts. In just 6 weeks, Christmas will come knocking at your front door, whether you like it or not. But hey! I know we can't just shop till we drop. We need cash to do that. Bonuses are still weeks away and I'll be darn sad if I can't have the items that caught my eye. It's a good thing Sears Layaway plan is back. Now one can reserve that beautiful kitchen cooking ware for mother or that wonderful tool set for hubby. Make a $15 deposit or 20% down, pay a in increments each week then take the items home when you're done with the payment. 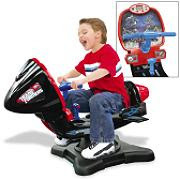 This Transformers Electronic Arcade Jet will be perfect for Ethan. He loves the Transformers and playing this jet-like toy with a simulated "battle" between the good and bad "bots" would be a dream come true for Ethan. My girls are all grown-up and their past wanting cutesy gifts. I know they would love to have and share this Stamina Premiere Pilates Machine. No need to go to the gym. A complete body workout could be done right at home. My son and hubby would definitely go for the X-box or Wii. As a matter of fact, we'd all want any of these two, better yet, both! Imagine, the whole family playing Rock band or Guitar hero. Fun! Everyone would be happy with their gifts. Better check out Sears Layaway for the perfect gift this Season. I consider the best gift that we can receive this Christmas is the cash gift. I love receiving or giving cash as gift.